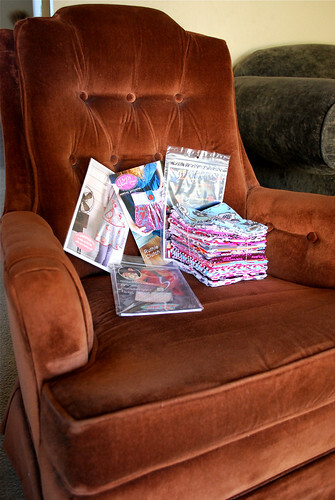 A chair is just a chair unless a giveaway is sitting there.... - Stop staring and start sewing! Happy Monday! I almost forgot about Sew Mama Sew's Giveaway day which is one of the funnest day's of the year (if you love fabric, and who doesn't?). Not to be confused with the giveaway's I do on my blog every Friday (I will draw last Friday's winner on Friday since this is gearing up to be a crazy week already). This time I'm giving away something super awesome! No, not this cool chair that we just grabbed off of the neighbors lawn (it's bulk garbage pick up day and this is pretty much how we furnish our house!). I'm giving away this MASSIVE fat quarter stack of the entire Woodland Delight collection by one of my favorite designers, Paula Prass. It's 25 prints, 6 1/4 yards total, and has a retail value of 75.00. But wait! That's not all! I'm also giving away 4 patterns! A Stella Apron pattern by Tanya Whelan, Ruthie Clutch by Anna Maria Horner, Mischievous Gnome Messenger Bag by Sew Liberated and a Foreign Currency Quilt pattern by Cherry House Quilts. Yay!! This should keep you busy all summer long! Just leave a nice comment (although mean comments will be considered). And be sure to visit my store Fabritopia (click on the logo below too) because I'm always getting great stuff in (Lizzy House's Castle Peeps is coming in 2 weeks!!!!) and I usually have some pretty nice sales. 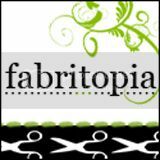 And be sure to join Fabritopia's mailing list to get the latest newsletter on sales and new arrivals. I rarely send out more than 1 each week so you won't get inundated with emails from me. New Flickr Group! Join and share!! Be a friend on Facebook too! The big drawing day is on Thursday! Have a great week and sew something fun! !